Apologies for the relative silence, ya’ll. Been seriously motoring on book 3, which is threatening to become a doorstopper. ::ulp:: I’m planning to chop it ruthlessly when I get into the editing phase because I just don’t believe a fantasy novel should be heavy enough to punch a hole in the fabric of existence, but for the time being Sieh is being a demanding little brat, and I’d better do what he wants or he’ll replace all my coffee with Taster’s Choice or something. So I’m just getting around to addressing this now. Last week there was a little confusion in the blogosphere because some folks dug through Orbit’s “forthcoming publications” catalog and found the preliminary cover of book 2 of the Inheritance Trilogy, The Broken Kingdoms. Nothing really wrong with that, since the catalog was after all online for anybody to download… but said bloggers didn’t realize the cover was preliminary, probably because the catalog didn’t say so. (Oops.) Which led to some confusion. And more blogging. And more confusion, as people emailed me with WTFs, wondering why I hadn’t posted anything about it. And so on. The good news is that people seem to like the preliminary cover. The bad — or rather, neutral — news is, it’s the preliminary cover. See, despite their availability, publisher “forthcoming” catalogs aren’t really meant for the public. For one thing, they come out so far in advance of the book’s publication — sometimes years before the book comes out — as to be meaningless for the purposes of retail marketing. Which is why they’re meant for wholesale marketing; they’re aimed at booksellers, distributors, and the like, to encourage them to put in orders for the forthcoming stuff. (Or so I understand. Remember, I’m new at this too.) These wholesale folks understand that the cover art isn’t final, but they still want to have an idea of what the publisher is thinking in terms of the book’s marketing push and direction. Descriptive blurbs are also helpful for that purpose, but to mutilate a cliche, a picture is worth a thousand retail orders. Even if that picture isn’t the one that will ultimately go on the book. Like night and day, isn’t it? Literally; I love that the final version has Nahadoth superimposed over a bright sunlit sky. (Yeah, that’s Naha. I’m not sure why people keep thinking it’s Yeine, but AFAIC it’s a beautifully literal interpretation of Naha as he frequently appears in the book — a silhouette, but others can always see his eyes.) I was warned from the get-go that the text on the prelim version was just a placeholder, so that was no big deal. As the Orbit folks explained to me, the preliminary cover had too many elements jostling for the reader’s attention, which is why they decided to remove some of them (Yeine most noticeably, which I’ve discussed before) and focus the reader’s eye on the palace. Since dammit Jim I’m a writer not a design professional, I didn’t ask why the color palette was swapped, or the “Book One of the Inheritance Trilogy” band (which appeared only on the Advanced Reader Copies) was removed, or any of that. When I saw the final version, I was so stunned and delighted that I didn’t care why the changes had been made. I just knew I liked the result. Thing is, until I saw the final, I thought the preliminary was pretty cool, too. And it was! But now you know why I haven’t been crowing about the preliminary cover of book 2 myself. Granted, book 2’s cover isn’t likely to change as drastically as book 1’s did, since by this point in the series we’re all a little more comfortable with its overall style… but it will change. So I haven’t gotten too attached to the prelim, and none of you should, either. 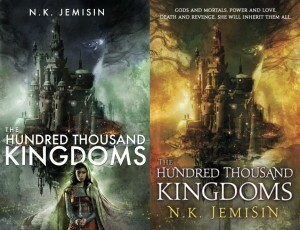 Anyway, trust me, when the final cover for The Broken Kingdoms is ready to show off, you’ll definitely hear alllll about it here. Hey, there is absolutely nothing wrong with fantasy novels large enough to punch a hole in the fabric of existence. I mean, unless you’re writing one, and you realize that NORMAL PEOPLE (i.e. writers, in so far as writers can be normal) could have gotten 3 to 4 novels out of the same amount of writing time/blood/sweat/tears while you are only getting 1. Not that I know anything about that. It is hard, though, waiting for the release of the final cover. Are you sure? I have a regular copy and it has that band. The band certainly didn’t appear on any of the copies I received! Are you sure you don’t have an ARC? Or are you in a country other than the US? I can only echo Kate Elliott (whose works are also on my bookcase) that some of us can cope with longer books — at least as long as there’s an IKEA within driving distance, so that one can actually find the books one wants to re-read on one’s shelves. And I do like to re-read the earlier books when I get into a series…. I checked, and it’s the UK edition–since I’m in the Netherlands, I always order online, which means I end up with an equal distribution of US/UK editions and don’t always bother to check which is which. Kate Elliott? I love your books! Ms Jemisin, I truly enjoyed your first book! At first, I almost didn’t buy it. I usually look for books that are “thicker” rather than thinner because I figure the author has deeper character development and depth to the story. But with 400-ish pages, I decided to give it a shot. I’m glad I did. I am an avid reader and have read many fantasy, sci-fi, mysteries, thrillers, and fiction novels. I loved the deep thought you put into your story. The characters kept my interest and had me wondering what other depths I was in store to discover. I’m looking forward to your next book. Can I ask you a question? Do you have any tips for writers who are looking to find an agent to assist with getting published? I wrote the first book of my trilogy several years ago and am in the middle of writing book two. After trying to get an agent through the use of those large books about publishing, I eventually went through a self-publisher who worked up a book cover for me and made my book available on-line at major stores. Of course, without an agent to work with and help with sales, most books will not gain much attention. So, please, any advice you can give would be so appreciated! Sorry for the delay! Been busy. The best information on how to find an agent that I used was the SFWA website; it includes sample query letters, sample synopses, and a link to the all-important list of recommended and disreputable agents at Preditors and Editors. There was also a detailed explanation of what to do, and what not to do, at Writer Beware. That gave me everything I needed to start the search. I also used Locus magazine — their “People and Publishing” section (available only in the print ‘zine, I think) lists agents who have recently made deals on behalf of their authors. I subscribed for a year and kept track of which agents were selling to houses I was interested in, on behalf of authors whose work I liked, and I queried those agents first when my book was ready. This is all relevant to SF/F, note. A clarification, though, or maybe a misunderstanding on my part — it sounds like your book has already been published, and you’re looking for an agent to help you sell it after the fact? Or sell it to retailers/distributors? Agents don’t help with sales in the way you seem to be describing. Agents help with selling the book to a publisher, after it’s written but before publication. Once a book is published — even self-published — it’s up to the publisher (or you, if you’ve self-published) to help with marketing it to retailers, etc. So the book that you’ve self-published isn’t really going to interest an agent; it’s already too late for her/him to help you with that. But if you’ve got another unpublished book ready to go, then by all means you should try to find representation for it.